Verlaine, the Subway and Me. 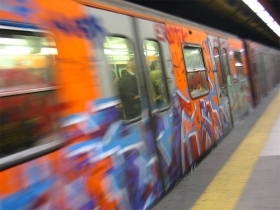 I was heading to a poetry reading last Friday and, given the hectic traffic of Friday afternoons in the Eternal city, I decided to opt for a subway ride. The only reason for which I "enjoy" the crowded subway is that it gives me the chance to read and so I sat down holding a book by Verlaine in my hands. I was literally immersed in the beauty of the lines in French until the old lady close to me started to grumble. Maybe she would have preferred a different read--no poetry in the first place and what is more not in French! I felt sorry she could not have any fun taking a peek at my book. This gave me the opportunity to scan for some time the other people sitting and standing close to me. What I saw inspired the poem I wrote, today. A poem on decadence, status symbols and Verlaine of course. Erato sings and I write.